Released in 2008 and directed by Byron Howard and Chris Williams, Bolt is one of Disney’s ever-increasing number of CGI films developed in-house instead of through their partnership/ownership of Pixar. Maybe it’s just because I hadn’t seen any of them myself until 2010’s Tangled, but the first few (Chicken Little and Meet the Robinsons) seemed unimpressive from previews. Bolt was the first one to look as though the process had started to “gel” some. After watching it, this fortunately was the case. Bolt tells the story of, well, Bolt — a dog who is supremely devoted to his owner Penny (Miley Cyrus) and week after week protects her from the clutches of Dr. Calico (Malcolm McDowell), by using his array of super-powers to overcome Calico’s goons. At least, that’s the premise of his TV show. But the director (James Lipton) insists that Bolt remain completely unaware he’s in a television show, so that his reactions to Penny’s endangerment will remain realistic. After a cliffhanger episode, Bolt escapes from his trailer to “save” Penny, and winds up getting trapped in a box and shipped across the country to New York City, where he now has to find his way home without the aid of special effects… and is still unaware that his powers are entirely fictional. On a ranked list of Bolt’s talents and abilities, “keen observation” is #753. When humans aren’t on the scene, the barks and other noises made by animals are translated into human speech. 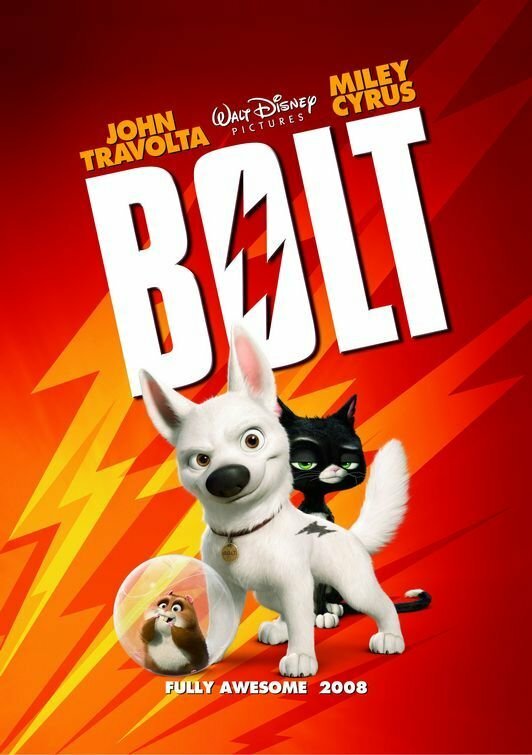 Bolt is voiced by John Travolta, and Travolta makes for a better voice actor than might be expected, as Bolt’s determination and personality come through strongly in the inflection that Travolta gives his speech. 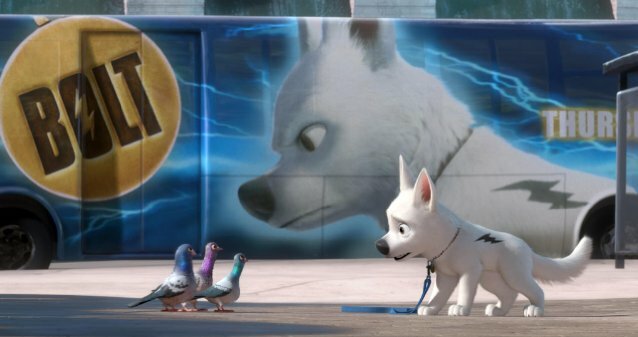 Bolt is set onto an alley-cat named Mittens by a trio of pigeons who closely resemble Warner Brothers’ “Goodfeathers” (which is amusing considering how unthinkable a non-satirical cross-company reference would have been when Animaniacs was being made.) Bolt thinks Mittens is a villain, Mittens thinks (with some justification) that Bolt is delusional, but Bolt forces her along on his quest. Mittens is voiced by Susie Essman, and nearly everything she says is dripping with sarcasm. The two are eventually joined by an overenthusiastic hamster named Rhino (Mark Walton), and this trio forms the core of the story. The film is pretty much your standard “road movie” with a confused protagonist, a cynical sidekick, and a delusional tag-along. It’s not a complicated plot, but such things never are; what makes or breaks such a movie are the characters and the dialogue. And Bolt is full of funny dialogue. Mittens, as the designated cynic, gets the bulk of the funny lines, but all three main characters get their share, and Bolt’s explanation for his lost powers sets up a running gag with some hilarious scenes throughout the film. I found Rhino to be entertaining and he managed to fall short of being annoying with his high-pitched enthusiasm. On the human-character side of the equation, the standout here is Greg Germann voicing Penny’s agent; he’s so believably irritating that I have to suspect that he is at least partially drawn from life. Malcolm McDowell’s role as “Dr. Calico” is essentially a cameo, but you can tell he’s having fun playing the hammy villain. And Miley Cyrus, as Penny, is believable as a young actress feeling somewhat confined by her role; this may not be much of a stretch for her, but it works. Bolt doesn’t have much of the traditional Disney “feel” to a film; it’s not a musical, and it’s not adapted from folklore or fairy tales. Its nature is a lot more in keeping with something out of Pixar or Dreamworks. But that’s hardly a knock on the film. 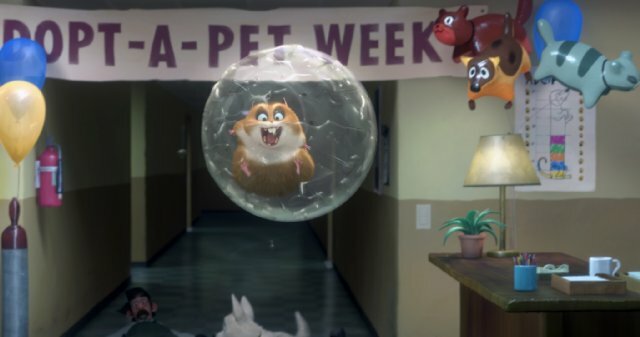 It may not be what long-time Disney movie viewers would expect out of the studio, but it’s still an entertaining, funny film that’s suitable for kids and enjoyable for adults. This entry was posted in Movie Reviews and tagged 2000s, 4 Stars, Bolt, Byron Howard, Chris Williams, Disney, Greg Germann, James Lipton, John Travolta, Malcolm McDowell, Mark Walton, Miley Cyrus, movies, reviews, Susie Essman. Bookmark the permalink. Want to though. I hear good things. It is funny, my girls just didn’t click with this one. So much so that I don’t think we have seen it from start to finish. We have seen it all, but not at the same time….. if that makes sense!!?? Yeah, that makes sense… there are a few films I’ve seen “piecemeal”. Sorry your daughters didn’t like it; I guess not even a Disney kid film is going to have universal appeal.